Whether you’re celebrating with your partner or a great group of friends, Valentine’s Day is the perfect opportunity to show people just how much you care about them. Although many don’t take the opportunity, this can include people in your professional life as well. As a financial advisor, clients always appreciate a little reminder that their business is important to you! We see most companies do this in December, around the holidays. 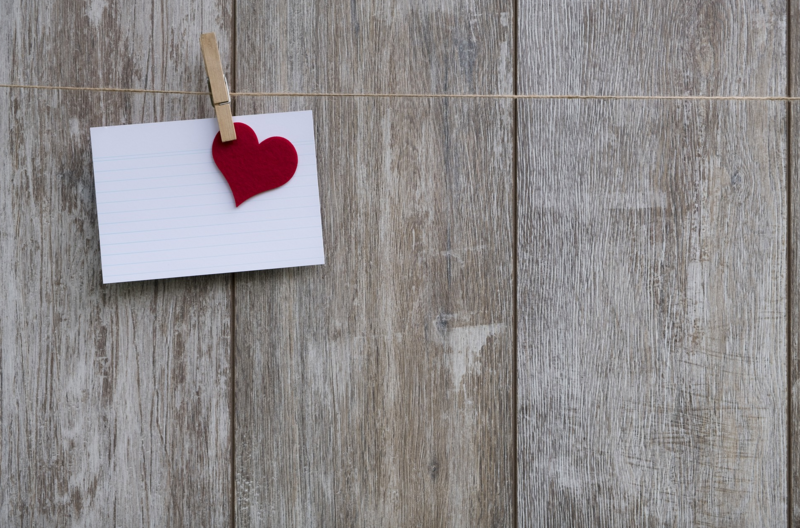 By choosing to do something special for your clients in February for Valentine’s Day instead, your company will stand out even more and clients will receive a fun surprise. By taking the time to do something personal for your clients, you’re setting yourself apart and solidifying their trust in your ability to provide quality service. A financial advisor can quickly become a close relationship for many people, so it’s especially important to show that you are willing to go the extra mile. But what exactly should you do? 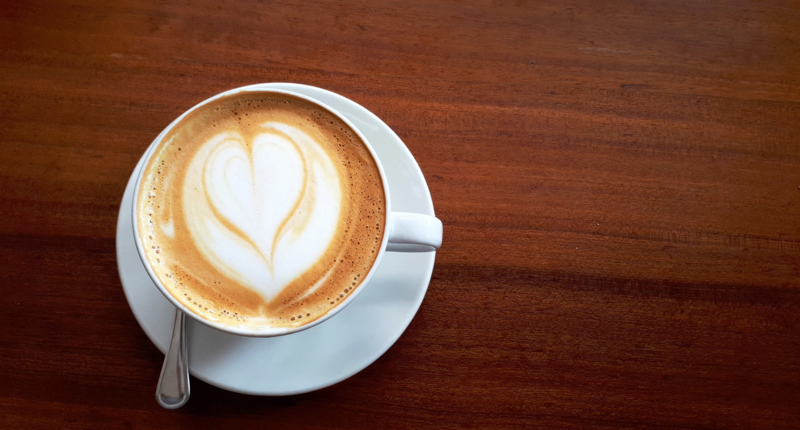 If you need some inspiration, here’s some ways financial advisors can make their clients feel loved, not just on Valentine’s Day, but everyday! With the prevalence of constant digital communication, handwritten notes are now few and far between. However, a handwritten note can go a long way. It shows you’ve taken the time and effort to put thought and time into sending your client a nice message. It also gives your clients something tangible to remember you by besides a business card. They’ll love and appreciate the detail and thought you’ve put into it a special handwritten note. Depending on the reason, consider including a gift card or some other small, useful gift. For example, as their advisor, maybe you know they just purchased a new home so you can include a gift card to a local home improvement store. How personal you choose to be depends on the nature of the relationship. If you’re having trouble writing it, just stick to the basics. 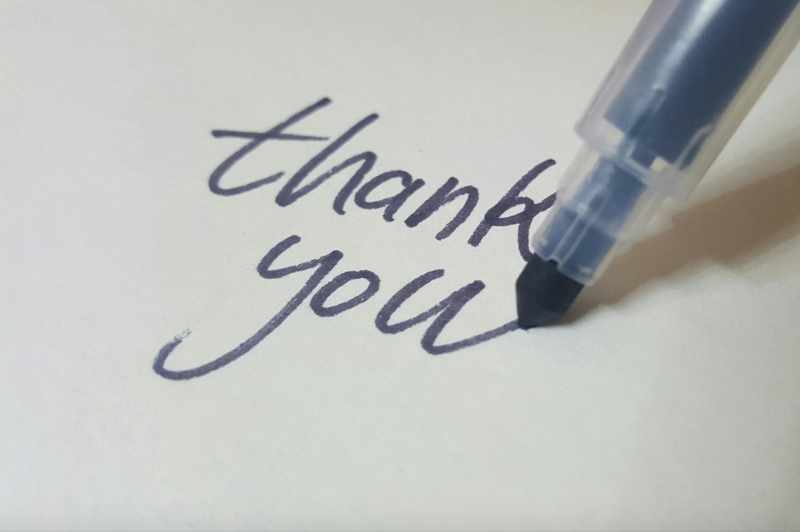 Thank them for working with you and mention that you look forward to continuing to get to know them. It doesn’t take more than a few minutes to go a long way! If you’re looking to go a little further for particularly important clients, why not send a small package or gift basket? Everyone loves receiving gifts and they’re an easy way to go above and beyond. Whether you choose to send something fun, useful or heartfelt depends on your firm’s personality and brand. Some examples of good things to send could include desserts, flowers, or company branded merchandise. You could also choose to do something specific to your geographic location, such as treats from a well-known local bakery. 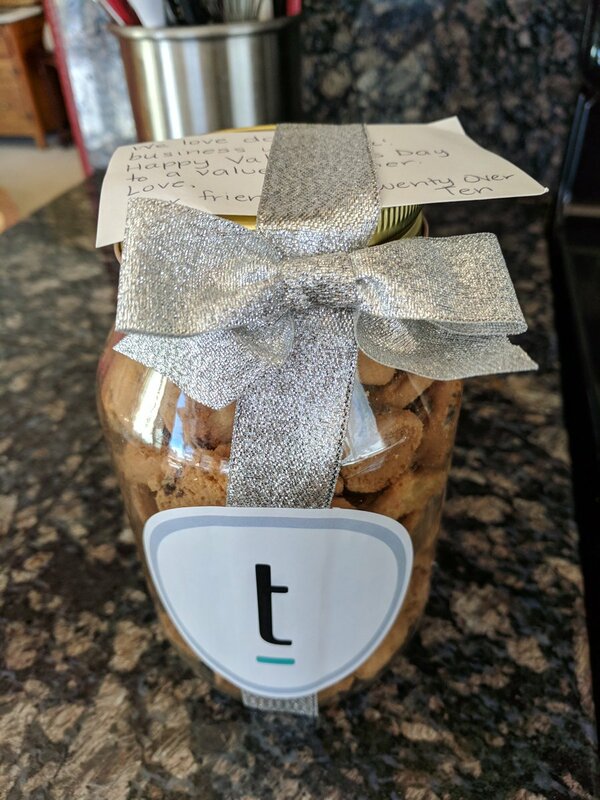 This year at Twenty Over Ten, we sent our clients Valentine’s Day boxes of cookies and a handwritten note. Another great idea is to include your logo and use nice packaging to show professionalism when creating your package. A gift adds a little something special to your client’s day, keeps your company at the forefront of their mind, and gives them something to tell friends and family (potential clients) about! Let’s face it: people love free stuff. And freemiums are a great way to do just that. Whether its an ebook, tip sheet or planning calendar, give them free tools to keep them organized and make their lives easier and more efficient. For example, one of our recent blog posts, Creating Killer Blog Content Ideas for Your Financial Planning Blog, included a free editorial calendar template. That’s right – FREE! No strings attached. Ebooks are another great option. They allow you to offer quality information for your clients and show them all of the reasons you’re a great resource for them. You can even team up with a partner to write it. Although your freemium may be something small, people are going to remember any free, unexpected service and think more positively about your firm because of it. If there is any unique service your firm offers, give something that highlights this to remind them why they chose to work with you. Clients love to be heard and, as an advisor, I’m sure there are times when you feel like a therapist. Make sure you always listen and, when listening, take into account what changes you can be making for the client. Write down any key points they make and repeat them back as you close meetings. This is a great way to reiterate your attention to detail. Consider using a free service like Google Forms or Survey Monkey to distribute a survey to clients. 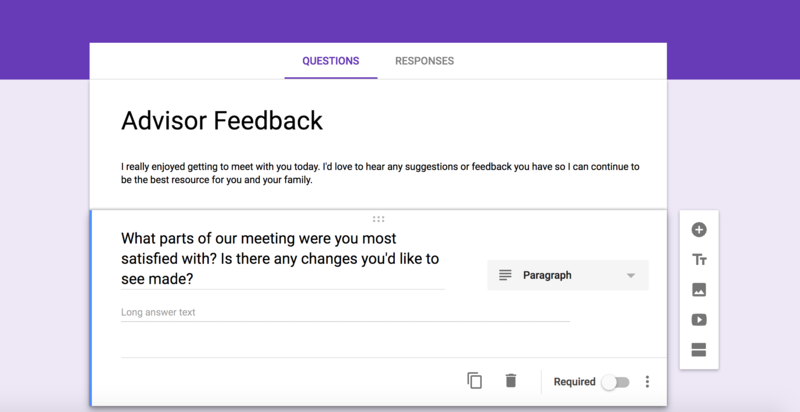 You can also consider distributing a short client survey through Survey Monkey or Google Forms to show clients that you are interested in their feedback and concerns. Having a way to voice their opinions makes clients feel like a bigger part of the process, It’s also very helpful for you to hear an honest opinion of what parts of your service they enjoy and what you can improve on! After meetings and conversations with your clients, it’s always a good practice to follow-up and state what your next steps or actions are. Doing so helps your clients feel comforted that things are being taken care of and that they’re in good hands. The most common way to do this is with a phone call or email. Be specific about what you talked about and how you’ve been working on their plan. This will show that you’ve been putting in the extra effort and continue to plan even after your meeting. Clients notice and appreciate this! This is important because, if a client feels safe and well taken care of with your business, they are more likely to recommend you to others, share good opinions on social media and keep coming back to your business. 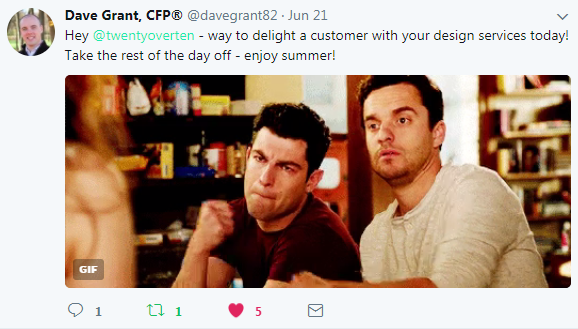 An appreciative Twenty Over Ten client shares the love on social media. No matter what you decide to do, a heartfelt gesture won’t go unnoticed. We hope you have a happy Valentine’s Day!